Chemical peels are a treatment as old as time….or as old as Cleopatra, in any case. Two thousand years ago, Cleopatra soaked in milk baths to keep her skin smooth and young-looking, a fact we know from her written publications of beauty and skin care tips. A potent active ingredient in milk is lactic acid – an alpha hydroxy acid – which remains one of the most popular acids still used in chemical peel treatments today. 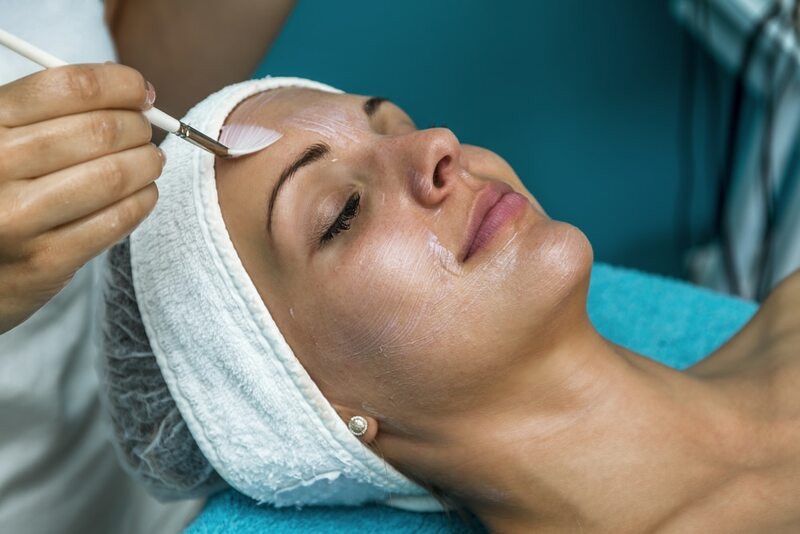 Chemical peels are a dermatological cosmetic procedure used to restore and rejuvenate the appearance of skin on the face, neck, chest, and hands. During treatment a chemical solution is applied to trouble areas on the skin. Acids exfoliate and remove dead and damaged skin cells, and the outer layer of skin blisters and peels off, revealing new, smoother skin underneath. Here’s everything you need to know before consulting with your dermatologist. Peels are not recommended for treatment of deep wrinkles, skin sags, or skin bulges. These may require use of a different cosmetic procedure. Chemical peels are also not recommended for people with inflammatory skin conditions (such as eczema), women who are nursing or pregnant, or people who have a medical diagnosis of cold sores. Peels have been known to trigger new cold sores in those who carry the virus. Please be aware that while light and medium peels are minimally invasive treatments with short recovery periods, deep peels are intense procedures that may require the use of local anesthesia or sedative and they necessitate several weeks to months of recovery time afterwards. What Type of Peel Should I Get? A light peel affects only the outer layer of skin. The procedure uses a mild acid – usually a fruit acid – to exfoliate the topmost skin layer, which will give your skin a softer, smoother, and more refreshed appearance. Light peels are designed to reduce mild discolorations, roughness, and age spots, but the level of penetration is superficial and will not help with deeper wrinkles, sun damage, freckles, and scars. The purpose of superficial peels is to brighten and rejuvenate skin, and treatments can be repeated every few weeks. A medium chemical peel penetrates not only the outer layer, but the middle layer of skin as well. The treatment uses a stronger acid to exfoliate and remove dead, damaged skin cells. A medium peel targets fine lines and wrinkles, age spots, freckles, moderate discolorations, and rough skin. The effects are longer-lasting than a superficial peel and you may repeat a medium peel after three to six months in order to maintain results. Unlike light and medium peels, a deep chemical peel can only be used on the face, and it can only be performed once. However, a deep peel leaves skin visibly transformed and has long-term results. A strong acid is used to penetrate deeply into the outer and middle layers of skin and drastically reduce the appearance of fine lines, wrinkles, age spots, freckles, discoloration, rough skin, abnormally pigmented areas, shallow scars, and even precancerous skin lesions (called actinic keratosis). After a light peel, you may have some redness and scaling for three to seven days. Apply lotion or cream on your skin to soothe irritation and wear sunscreen every day to protect your skin from sun damage. After a medium peel, you may have redness, swelling, and blistering for one to two weeks, while skin crusts and peels off. Apply lotion or cream to soothe irritation and avoid sun exposure until your skin is healed. After a deep peel, you will have several weeks of healing time. Skin will be bandaged, and may have redness, blisters, and severe swelling. In some cases, eyes will swell shut. Apply lotion or cream to soothe irritation and avoid sun exposure for three to six months. After undergoing a peel treatment, it is essential to follow your dermatologist’s aftercare orders closely. For medium and deep peels, he or she will provide you with specific instructions on how and when to wash your treated skin, and also what types and brands of skincare products to use. For more intense peels, your dermatologist may prescribe a course of antivirals to prevent infection. And in the case of a deep peel, you may also be prescribed a course of pain medications. Some people experience complications from chemical peels, including a temporary or permanent change in skin color, the risk of which can increase if you are taking birth control or become pregnant soon after undergoing a peel. If you have a history of cold sores, chemical peel treatments may trigger a new outbreak. Florida Dermatology and Skin Cancer Centers is proud to offer two types of highly effective chemical peels, with each peel custom-formulated to a strength that matches your individual needs. Both our Glytone Peels and Jan Marini Peels deliver deeper restorative treatments than traditional facials. If you are interested in the benefits a chemical peel has to offer, we would love to see you in our office for a personal consultation. Explore our website and call one of our nine convenient locations today to make an appointment.